It doesn’t matter where in the world you are headed, there are some items that are standard when you pack. While many things can be procured overseas, some are more of an inconvenience than you would like to deal with on vacation. But often, they’re necessary. 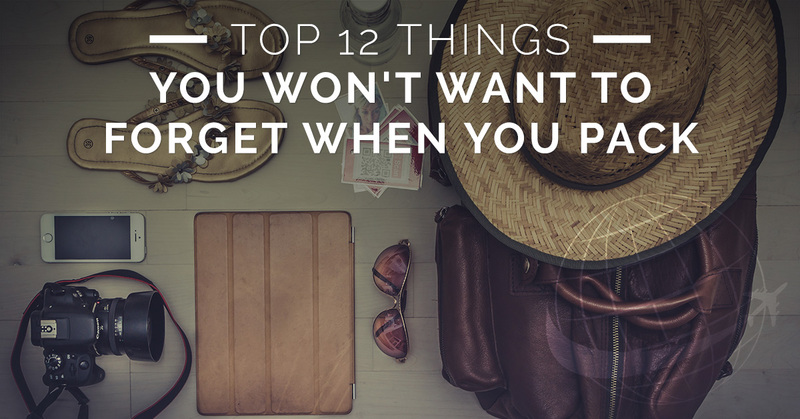 If you forget some of these items, depending where in the world you are, you’re either going to have a hard time finding them, or pay more than you would like. Don’t feel inconvenienced because you simply forgot to pack one of these 12 items, instead add them to your packing checklist prior to your trip to Israel to help ease your mind and make your vacation a breeze. If you plan on taking your phone abroad with you, whether because you have an international plan or you simply want to hop on the wifi at the hotel, it’s important to remember to bring along your charger. Forgetting a phone charger can cost you much more than you want to spend when you have to pick up a replacement at the airport, because your phone is just added luggage weight when you don’t have the charger to go with it. Don’t forget to toss it in your bag when you leave your house and head for your departure flight. Every country uses a different outlet type, and some even use different voltages. If you’re traveling with ANY type of electronic, you’re going to want to pack a set of outlet adaptors. Keep in mind that Israel uses a different outlet than both the United States and Europe. Also, consider packing a power converter. Your plug adaptor could have the power converter feature built in, but double check that you have one available to you either way. We know how often water bottles can get people in trouble at the airport when working their way through the security lines, however, a reusable water bottle, like a Nalgene or Camelback, can be beneficial on any trip. If you opt to carry it on, make sure it’s empty before you traverse security. If you pack on in your checked luggage, you won’t have to worry. This saves you from having to buy water bottles around the city and can be a lifesaver on a warm summer’s day. No one wants to think about getting hurt or sick on a vacation, but it can happen. A basic first aid kit will help you avoid having to find a store for band aids, ibuprofen, antibiotic ointment, or an anti-diarrheal when you’re feeling icky. Whether it’s blisters from touring or you simply got a headache, you’ll be glad you through the first aid basics in with your toiletries. You’re sure to not forget your camera when you pack for a trip, but what about all those accessories that you need in order to make your camera work? You’ll be surprised at how quickly you’ll go through memory card space or use up your battery power. Make sure you remember those accessories because they aren’t always easy to find. Pack more memory cards than you think you will need, disposable batteries, or an extra rechargeable battery with charger. Also consider throwing a plastic grocery bag in with your camera gear just in case you encounter any rain. Airplanes, public transit, and other public places can be dirty and germ covered. Need we say more? We briefly mentioned this in our previous blog on what you should always pack in your carry-on, but it’s exceptionally important to reiterate. Always have your passport on you and always have copies of your passport stored away. Keep a copy at home, keep a copy in your luggage, and keep a copy in your wallet. If anything were to happen to your passport, the copies will help to expedite getting the situation resolved with an American embassy. We know this one probably goes without mention, however, you’d be surprised how many individuals forget to pack a toothbrush or toothpaste, along with other toiletries they may need. Toiletries are easy enough to pick up during your travels, but if you’re very particular, these are things you don’t want to forget because brands are different all over the world. We also mentioned this point as something you don’t want to forget to pack in your carry-on. Having American dollars and currency local to your destination can be exceptionally helpful, especially since your bank probably has the best exchange rate. In addition, make sure to have your credit card and call your provider in advance to let them know you’ll be overseas. Avoid traveler’s checks and debit cards, as they are very hard to correct if something should happen to them. Visa has become the gold standard for when you travel to many countries these days. Whenever you travel abroad, it’s beneficial to have all your travel information printed out. You’ll never know where you’ll be able to use wifi, so don’t plan on relying on your email or Google Maps. Have everything printed and safely packed. And it probably won’t hurt to pick up a map of the local areas you’ll be visiting as well. While most people won’t forget their swimsuit when traveling to destinations, like Mexico, you’d be surprised how many people neglect to bring their swimsuit to a Mediterranean vacation. Whether you’re dipping into the Mediterranean or you go for a swim in the Dead Sea, you’re going to need your swimsuit in order to enjoy the experience. For most people, bringing their medications with them is common sense. Any prescriptions you take everyday should be in your bag, and you should make sure you have enough before you leave. However, other important medications sometimes get missed. If you have “as needed” medication or rescue medications, like an epipen, you’ll want to make sure to pack those just in case a situation arises where you need them. You wouldn’t want to be caught away from home without them. We could probably continue on with items that you’ll want to bring with you, but it’s important that you only bring what you need on any international trip. Between having to carry your luggage and possible baggage fees, it’s always best to travel light, yet prepared. Here at World Express Travel, we help make your international travel dreams come true, and our trips to Israel are truly one-of-a-kind. Whenever you’re ready to start jetsetting and head on your own excursion to Israel, contact the experienced travel professionals at World Express Travel!